Due to its small size, the amount of practice spaces for (metal) bands is fairly limited in Luxembourg; which is why many bands have come together and share the same location. The, arguably, best known one is the Bricherhaff, which houses the bands Sublind, Kraton and Dreadnought. At one point in time, members from the different bands filled in for their friends in a different band, which is why the place has been affectionately called Inzesthaff ever since. And it is exactly here where today’s band was founded and how it got its name: Inzest! Their debut record Collateral Damage is about to be released this weekend, February 9th, and I had the opportunity to listen to it in advance. Here are my thoughts! The quartet plays straight-forward black metal, and I’m pretty sure that their main objective is to annihilate the neck muscles of their listeners, because there is so much groove infused into the barrage of blast beats, that it’s hard to keep your head still. One of the main characteristics of black metal, to me, is a certain type of monotony in the songs that creates a feeling of desperate trance, which is achieved through the repetition of riffs ad nauseam. While I’m not a fan of that in most other genres, I can’t imagine this kind of music without it. With that being said, Inzest to that formula throughout the nine songs, and managed to drive me into the deepest despair more than once…and I mean that as a compliment. While Collateral Damage leaves a good first impression, it isn’t until the subsequent listening sessions that the record reveals its true beauty in the form of small details such as an almost hidden riff that is only barely audible on the right ear, or a sneaky fill on the drums. At this point, I really have to massively praise the production quality of the album, which elevates these forty minutes to a whole new level and has a genuine DIY feel to it, while sounding massive exactly where it matters. It is one of those rare occasions where the producer feels like the fifth member of the band, who understands what the musicians are looking for and emulates it perfectly. The entire instrumentation creates a perfect backdrop for the vocals, which radiate pure evil and will leave your soul frostbitten. They switch effortlessly between the typical black metal screams à la Abbath and the most hate-filled growls. 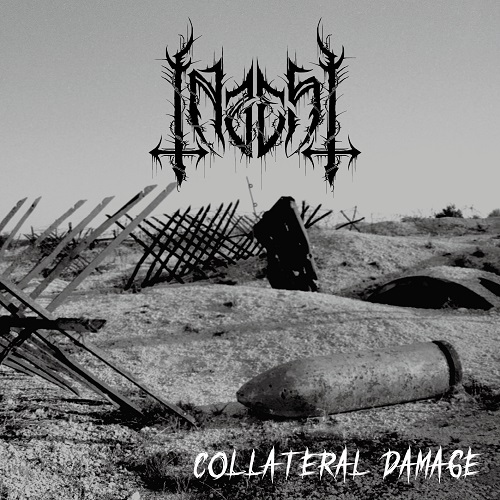 All in all, Collateral Damage is an impressive debut record and I am very glad that Inzest took their sweet time in releasing it after an impressive four years of existence under their belt already. Be sure to head over to their Facebook page if you want to know more about the release gig that is happening at Café Remelenger Stuff this Saturday. And in the meantime, check out the title track below!